Mark Mothersbaugh will present his "Beautiful Mutants" at the California State University, Fullerton Grand Central Art Center in Santa Ana, California. The exhibition will feature more than 400 photographic works by the artist in the Art Center's Project Room Gallery. A 288-page hardcover book "Beautiful Mutants" by Mark Mothersbaugh will be released at the opening. A book Signing will take place on September 1, 2007 from 7:00 to 8:00 pm. The exhibit will continue through October 21, 2007. Mothersbaugh describes "Beautiful Mutants" as "Images pulled from man's past... then corrected into sickeningly beautiful beings. A study of humans via symmetry using photos both recent & vintage." Mark Mothersbaugh co-founded the new wave band Devo with his friend Jerry Casale while they were art students at Kent State University in the 1970s. He has continued to create art and regularly exhibits and tours with his artwork. 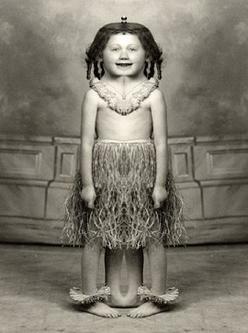 The image posted here is "Hula Hula Gal" by Mark Mothersbaugh. Hours: Tuesday to Sunday 11 a.m. - 4 p.m. with extended hours Friday & Saturday to 7 p.m., The "First Saturday" of each month galleries are open until 10 p.m.